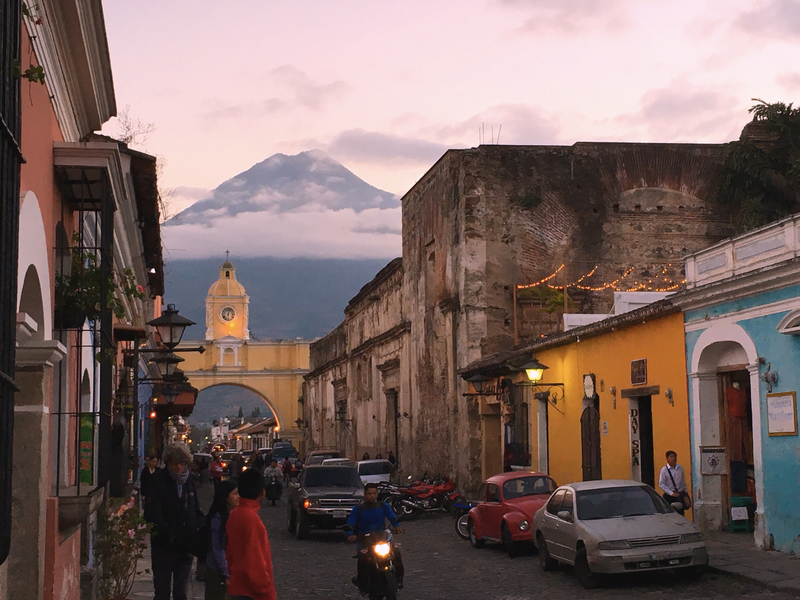 To wrap up our swing through Guatemala we came back through Antigua and Guatemala City, spending two days in each. Antigua is one of our favorite places anywhere; we loved it four years ago, we loved it 10 days ago, and we loved it for these last two days. On our first swing through Antigua we stayed at a beautiful little place that was maybe a 15-minute walk into the center of town and while that’s not horrible it’s also not ideal. So this time we spent a little more and stayed just about smack dab in the middle of everything. It made it so much easier to hang out in the central park, walk to cool restaurants, and explore those old ruined, abandoned churches that give the city so much character. 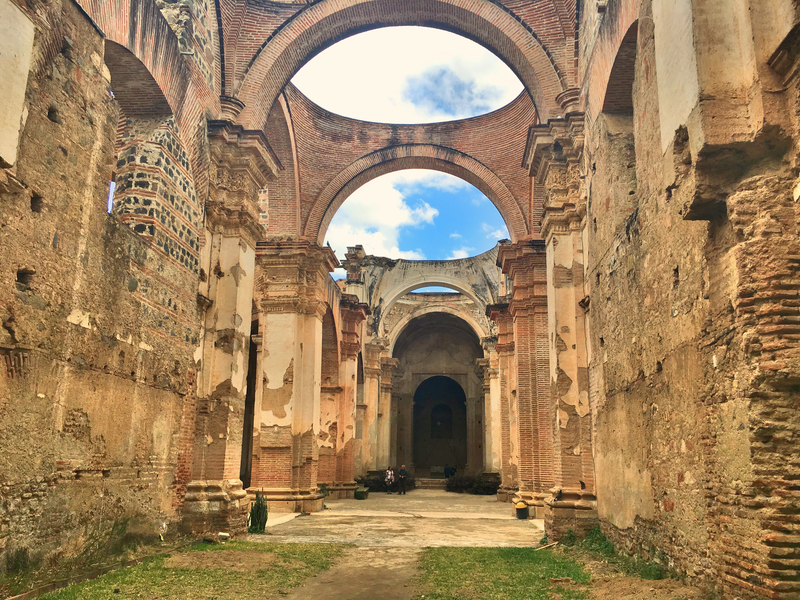 A highlight for us was touring the ruins of the old Cathedral of Santiago, wrecked by the earthquake of 1773, something that somehow we missed on our first two visits here. Oh yeah, that and the Absinthe Negroni we had one night at bar that specializes in absinthe drinks. We survived, though some day I might just start raving madly. 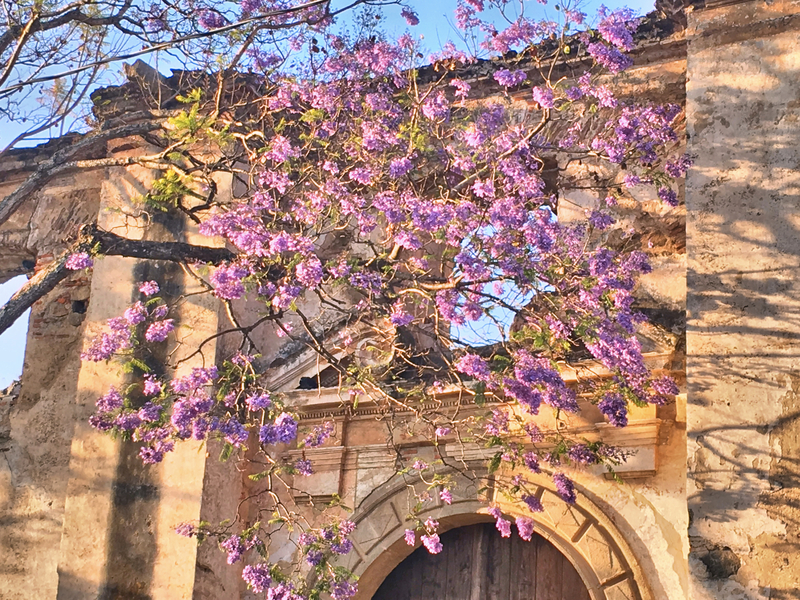 A classic shot of Antigua. The arch was a bridge connecting two parts of an old convent, now just a beautiful architectural statement. Looming behind is Volcá de Agua. The Church of Mercy, a new-ish building built next to ruins of the old Church of Mercy. And yeah, another volcano looming. 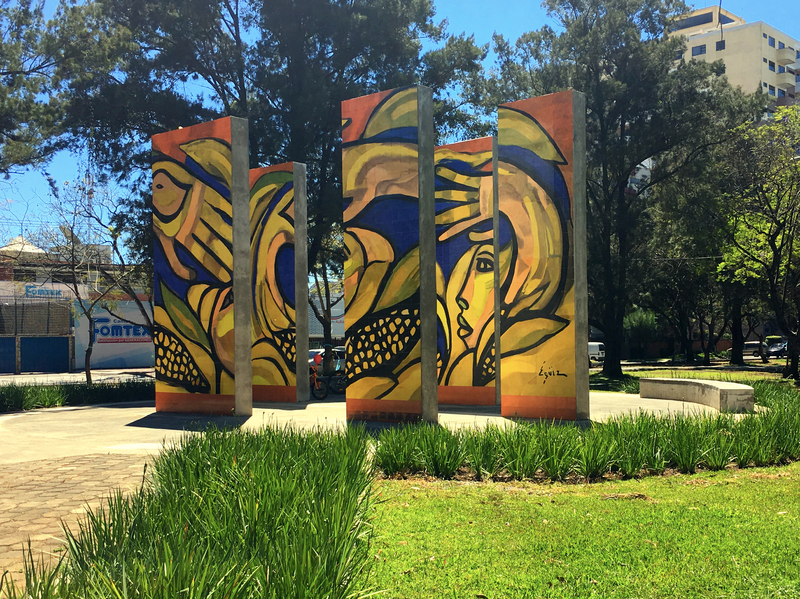 Then it was two days back in Guatemala City. We had to spend at least one night there, since Mark’s parents had an early flight out on Monday morning (the upscale hotel neighborhood is shockingly close to the airport, even though it’s very much a genuine neighborhood), so we figured we might as well spend two nights and show them a good time. 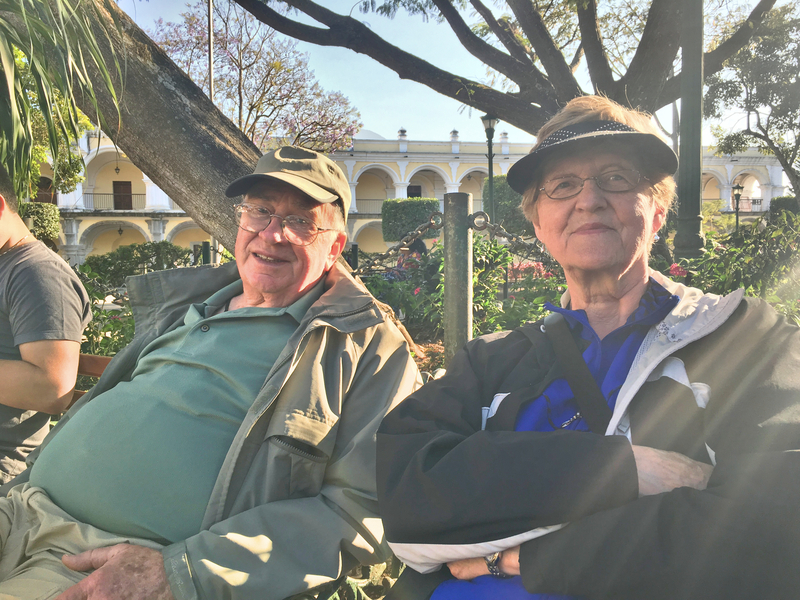 What’s a good time in Guatemala City? For us there are three components. First, there is a spectacular Greek restaurant, La Taberna del Griego, where we eat lunch nearly every day we’re there. The owner is Greek, born and raised, and the food is every bit as good as what we had last summer while we were traveling around Greece. Second, we love Avenue of the Americas on a Sunday when they close the street to traffic and seemingly everyone in the city – and their dogs – come out to walk, run, stroll, and bike. 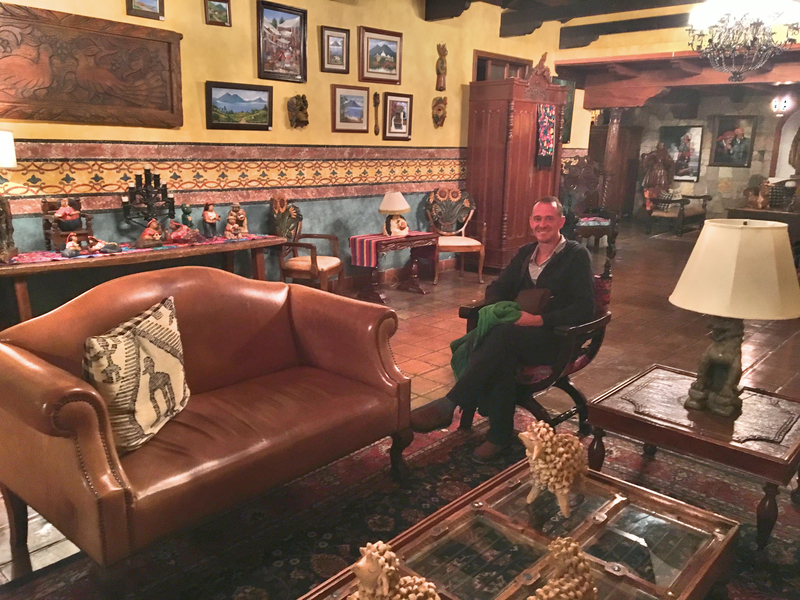 And finally, dinner at Hacienda Real, a big meat restaurant that serves stupendous quantities of grilled meat and vegetables. We ate there twice, though the second time none of us were hungry which seemed to discount the value of the place. We were particularly amused when Mark’s mother ordered off the children’s menu, but hey, whatever works, right? 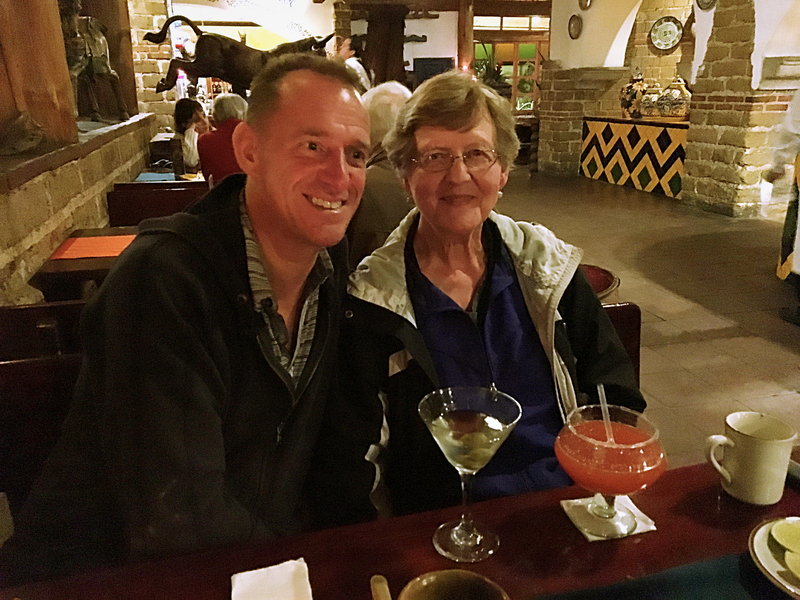 Finally, then, on Monday morning they flew back to Michigan while Mark & I got on a plane to head further south. Next stop, Peru! The old fountain in the ruins of the Church of Mercy was allegedly, at about 90 feet across, the biggest fountain in all of Spanish America. Pretty impressive. Moi, close up to the center of the fountain. While all is ruins around it, there is still a bit of water running through it. The modern Cathedral of Santiago lit up at night. The view from our hotel pool, looking straight across to the town of Santiago. Volcán Tolimán is on the left with Volcán San Pedro on the right. First, the setting. It sits just about a mile above sea level and has a surface area of 50 square miles, running about 7 miles across north to south and 11 miles east to west. With an average depth of nearly 1,000 feet, it is the deepest lake in Central America and is remarkably blue, clear, and clean. Created by a massive volcanic eruption 85,000 years ago as water filled the enormous caldera, today the lake is surrounded by three volcanoes, one of which is still active, and steep escarpments. The main town on the lake in Panajachel, where you can find some good restaurants and lots and lots of tourist shops. 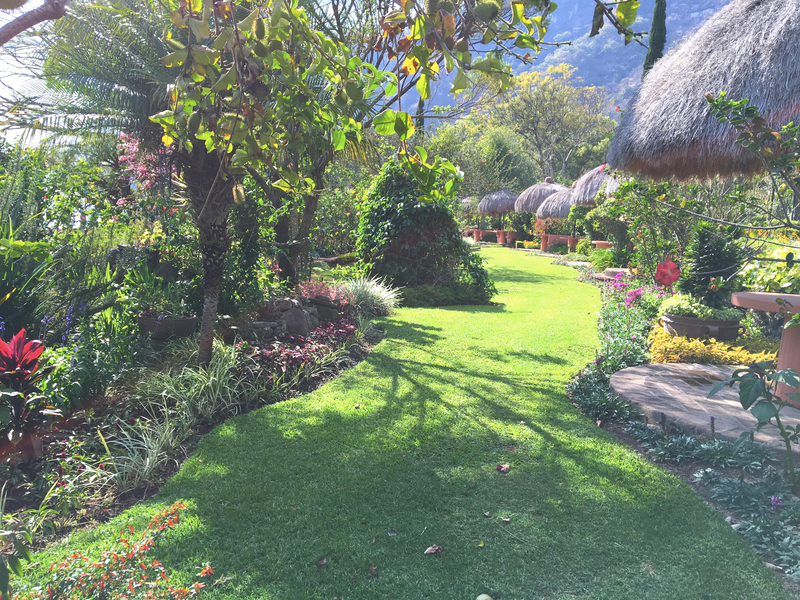 We stayed at Hotel Atitlán, a gorgeous resort with huge gardens and tropical birds maybe a mile from Panajachel. The hotel claims there are over 500 different plant species in its gardens, a number that’s not hard to believe. 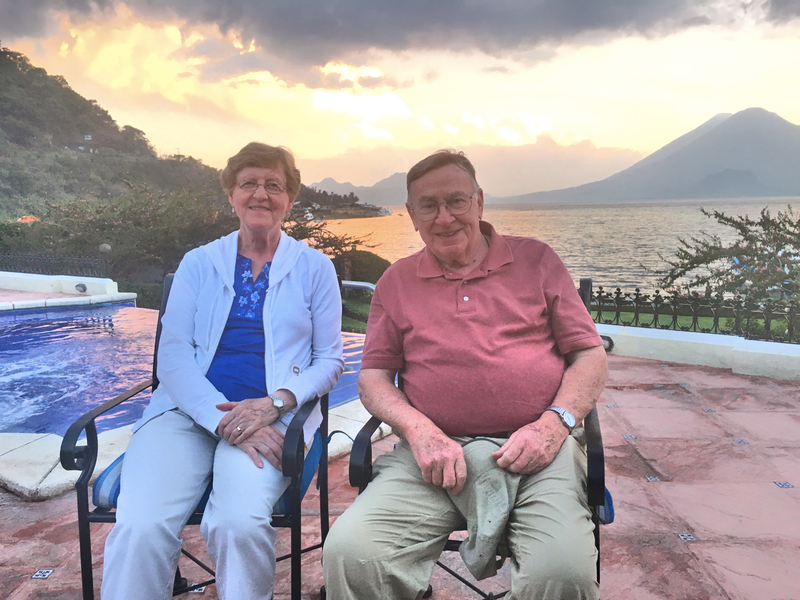 One of the great challenges of staying on Lake Atitlán is to climb Mount San Pedro, one of the three volcanoes on the lake. Mark & I did that four years ago when we were here and … we didn’t do it again. We both have vivid memories of how beautiful the hike up was, and how spectacular the view was from the top. And how unbelievably sore we were, primarily from the descent. I was seriously tempted to do it again, but decided I didn’t want to spend the next week limping around. 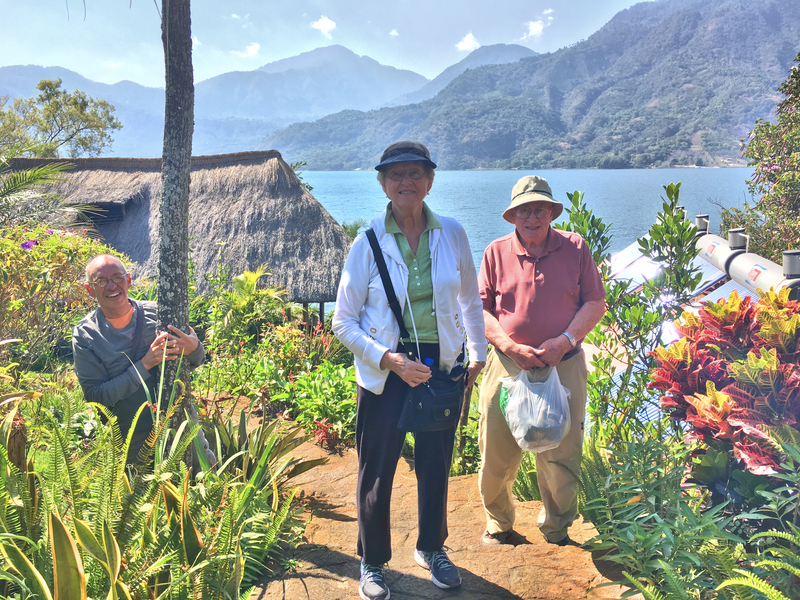 Instead, with Mark’s parents, we hired a boat to take us across the lake for a day trip to Santiago, the largest of the indigenous communities that still circle the lake. Suddenly we were in a different world, where older men still wear these traditional white-striped embroidered pants. They were on sale in the markets but I somehow resisted the temptation. Instead we wandered around town a bit before stopping for a great lakeside lunch and then heading back to our own little paradise. That was it. We remain a bit surprised at how cool the weather is, but under the midday sun it was warm enough to enjoy sitting around the hotel’s pool. As late afternoon moved in the large hot tub next to the pool would call, though unfortunately it would often call numbers of people from the packaged tours who stay at the hotel. All in all, a beautiful place to stop for a few days – or longer. We’re going to have to make it to Lake Como and Lake Tahoe to make our own judgments on which is the most beautiful. 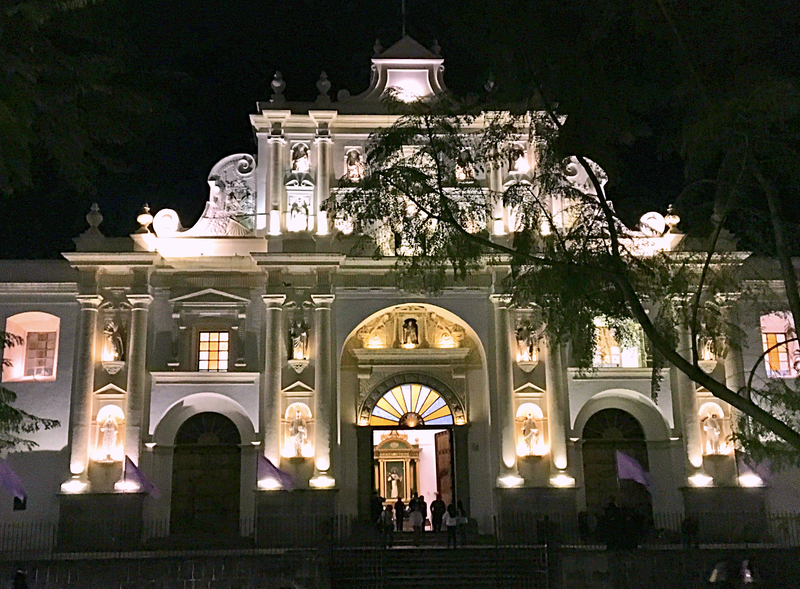 The Church of the Holy Spirit in Quetzaltenango, right off the main square. The ornate facade is all that’s left of the 1532 original church, destroyed by an earthquake in 1902. Behind it is the modern replacement, finished in 1990. 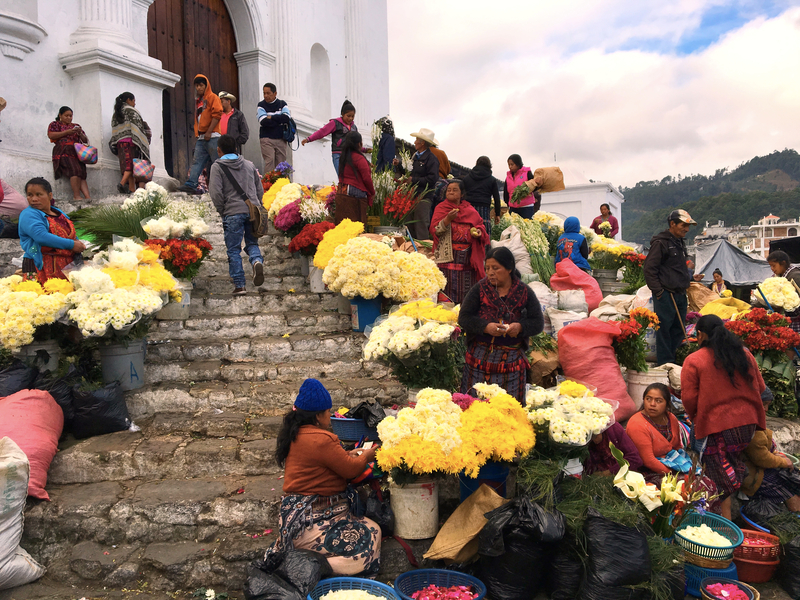 Here we are up in the Guatemalan highlands. 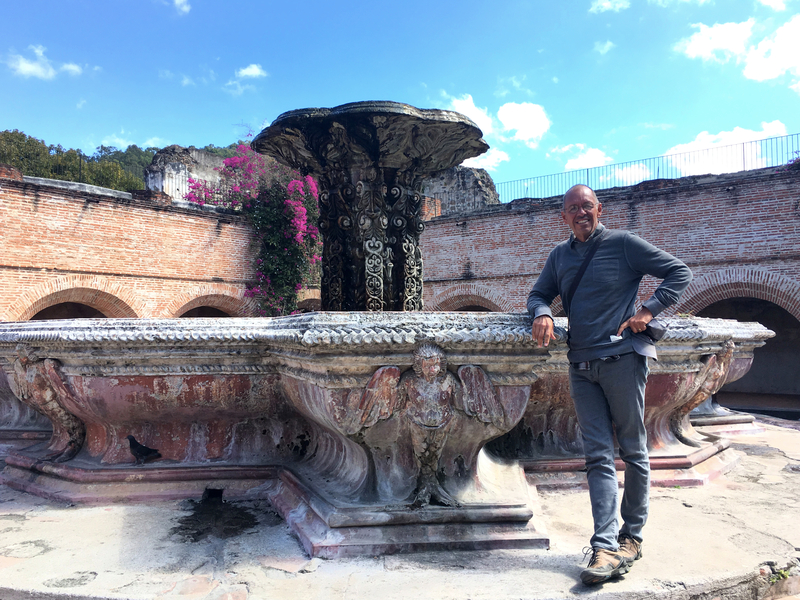 First stop for two nights was Quetzaltenango, “Place of the Quetzal.” (The resplendent quetzal is a big, colorful bird – I’m sure if I ever saw one I’d assume it was a parrot – that is the national bird of Guatemala and the name of the country’s currency.) 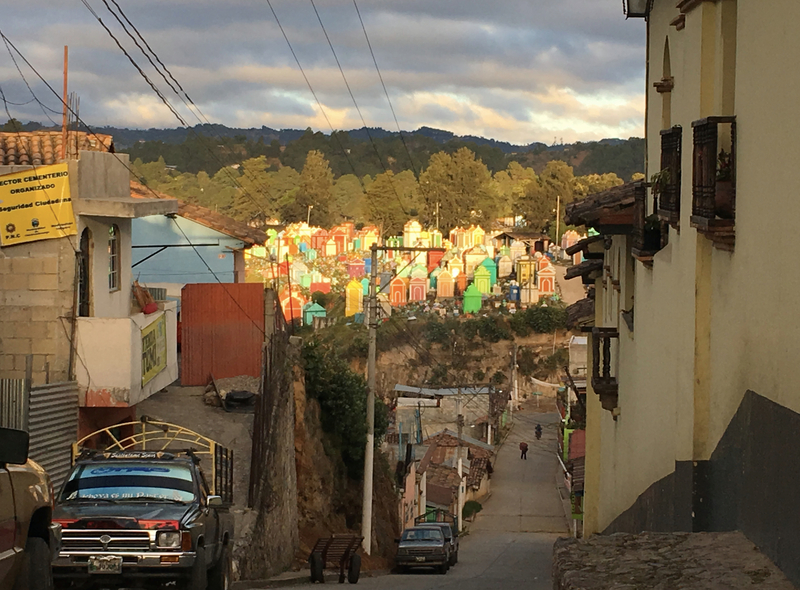 Sitting at 7,700 feet above sea level, Queztaltenango is Guatemala’s second largest city and over the last 20 years or so something of a boom town. 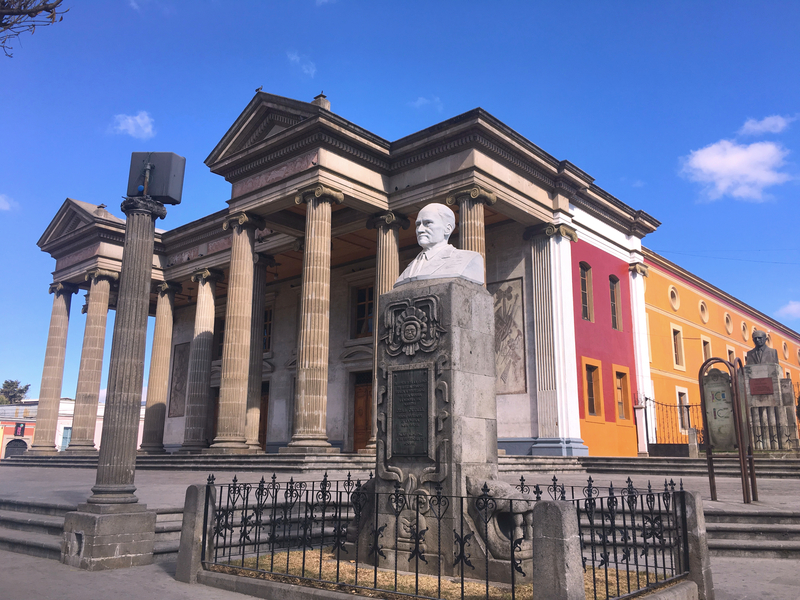 Prior to the 16th century Spanish conquest the city, already some 300 years old, was known as Xelajú; thus today many people still refer to the city as Xela (shay-lah) which is a heckuva lot easier to write or say than Quetzaltenango. 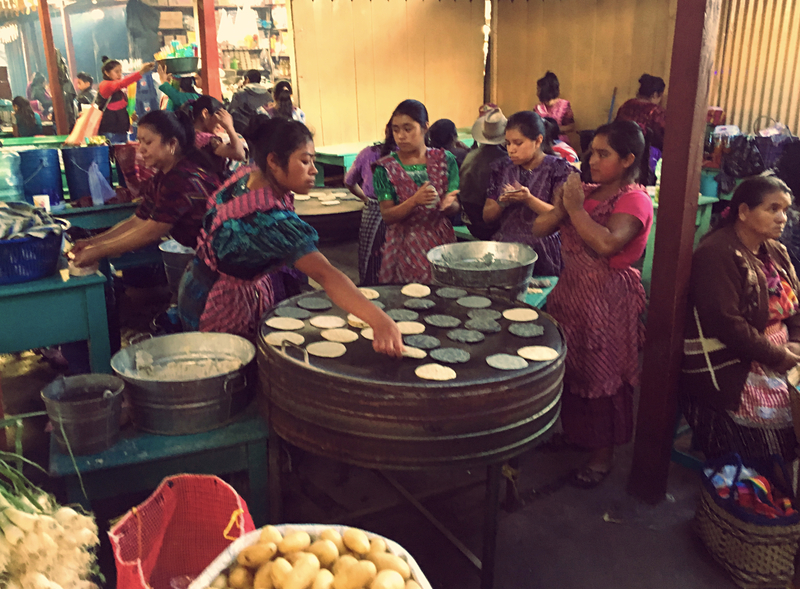 Why go to Xela? To be honest, there’s not a great reason unless you have a lot of time. 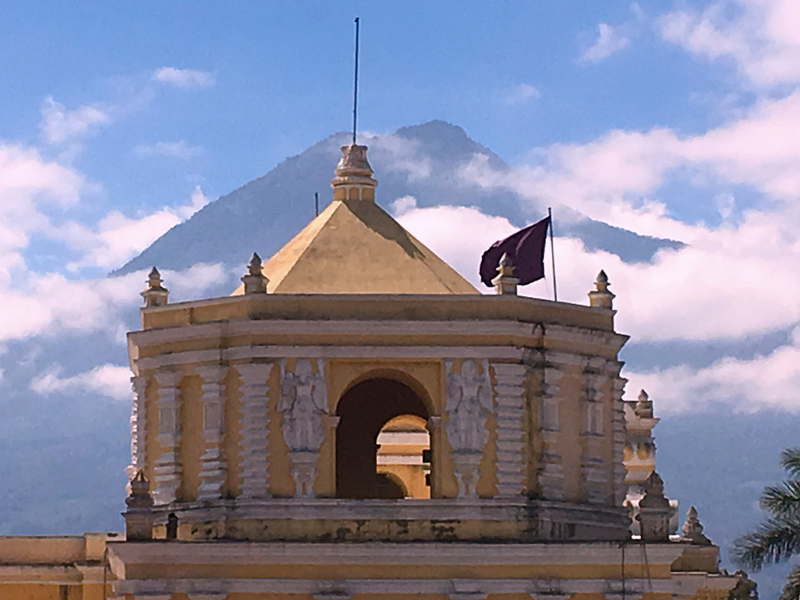 It’s a chance to see Guatemala sans significant tourism, sort of the real Guatemala. There’s a nice central park, a few good restaurants, a cool highlands climate, and … not much else. A nice place to stop for two days but unless you want to study Spanish – there are seemingly hundreds of Spanish language schools here – or hike up some serious volcanos, but otherwise not much reason to stick around long. 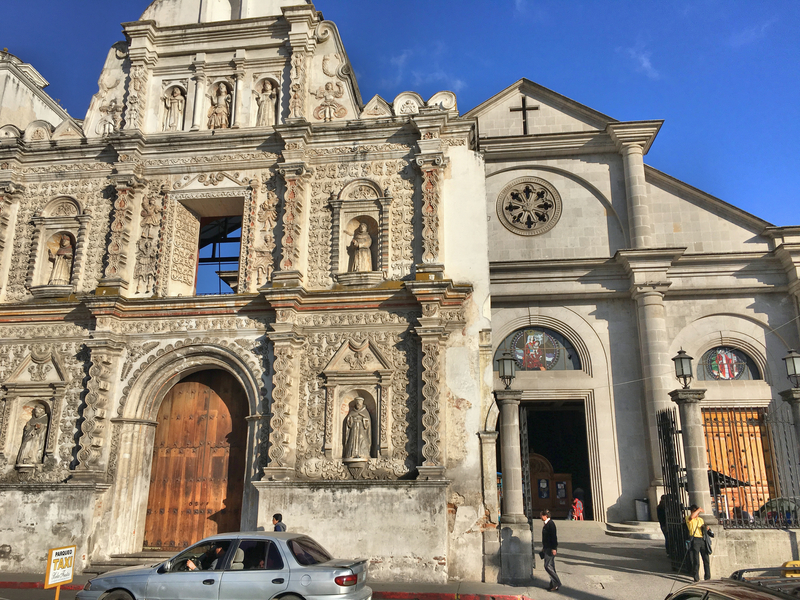 At one point Mark & I were walking through Xela and saw a big, imposing building. We saw an open door and went in, where someone working there encouraged us to wander around. 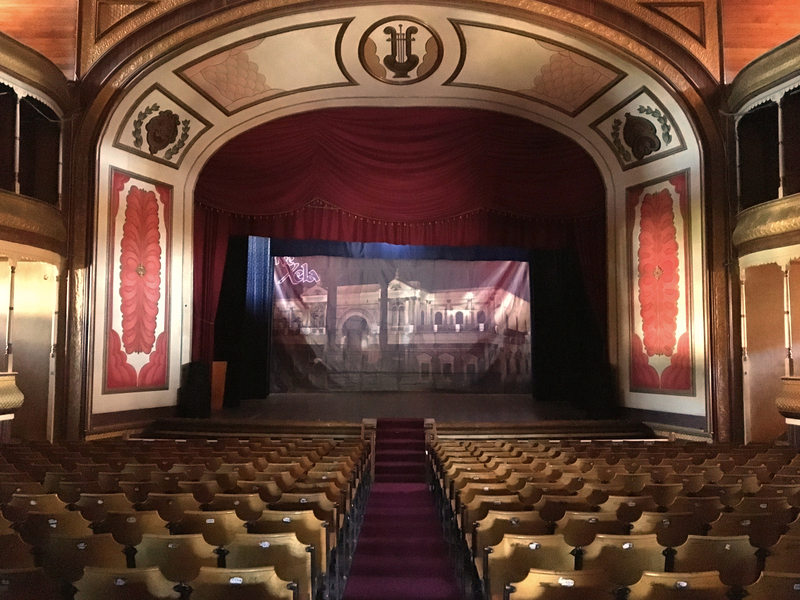 There we were in a huge, grand theater. Pretty cool. 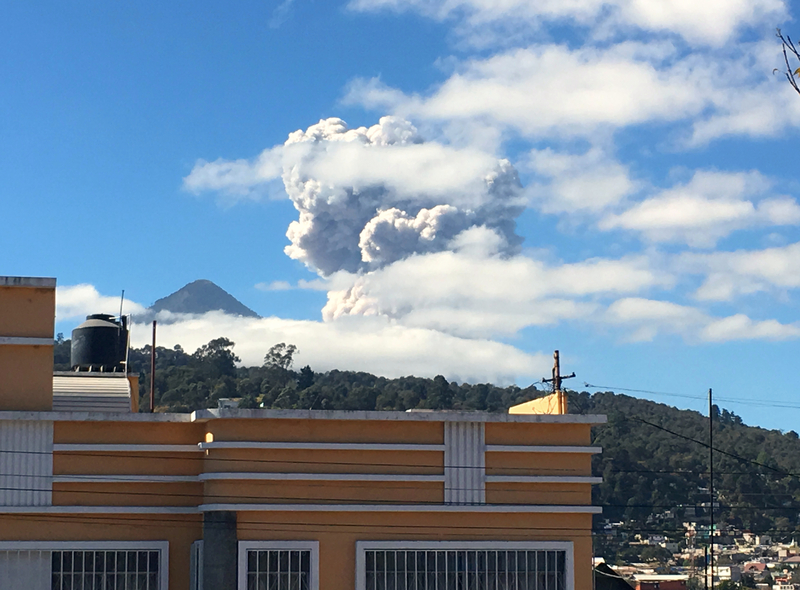 As we walked out, we noticed billowing smoke from some volcanic emission. It continued to grow and loom, but locals didn’t pay it much attention; apparently it’s not that uncommon. 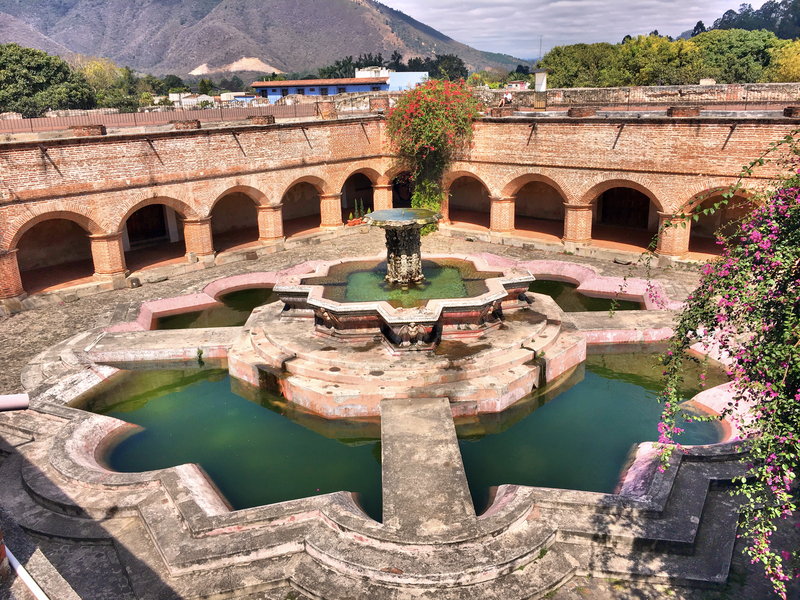 Next stop was Chichicastenango, “Place of the Nettles.” It’s not too long a drive from Xela, but we decided to be a little adventurous and take the secondary route on Google Maps, as opposed to the main route recommended. It’s worth saying upfront that we survived, but there were moments we weren’t so sure how it was going to turn out. All was going just fine on this secondary route when the pavement ended. And then we were in a pretty remote part of Guatemala unsure how many miles of rough gravel roads were in front of us. A bunch, it turns out. And while we considered turning back, fortunately we didn’t and instead got to see a part of the countryside that’s really off the beaten track. Eventually, a bit later than anticipated, we made it to Chichicastenango. 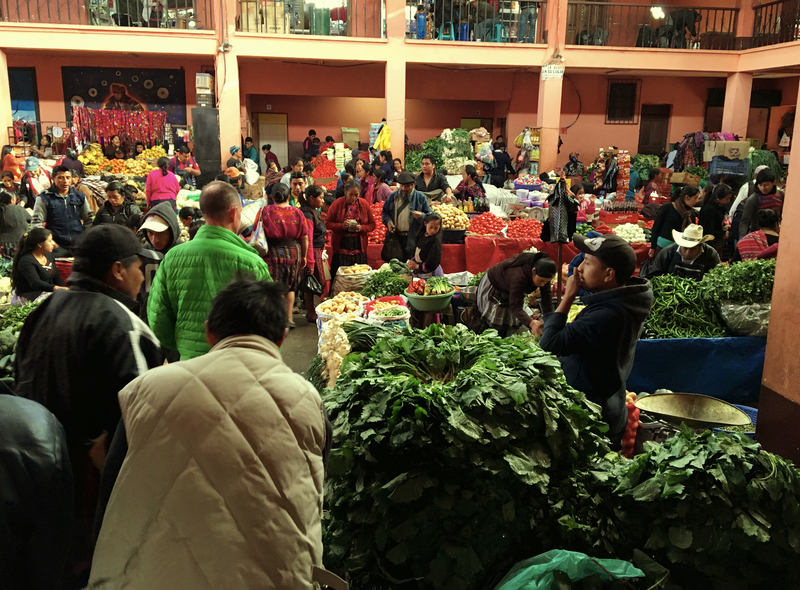 There is one good reason to come to Chichi, a huge market that occurs on Thursdays and Sundays. So we pulled in Saturday afternoon as they were starting to set up and spent a couple hours Sunday morning wandering through the market where they sell pretty much everything you can imagine. 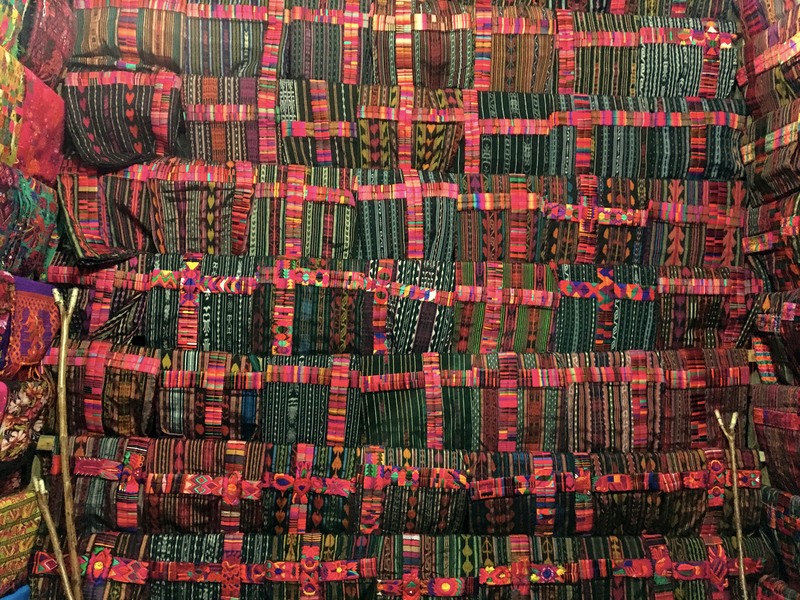 Masks and textiles, fruits and vegetables, hardware, toiletries, rocks and plastic toys, beans and rice and soap and belts and on and on. Chickens, live and dead. Pigs, big and small. Candles. No Apple products, but it seemed like pretty much anything else you could want. 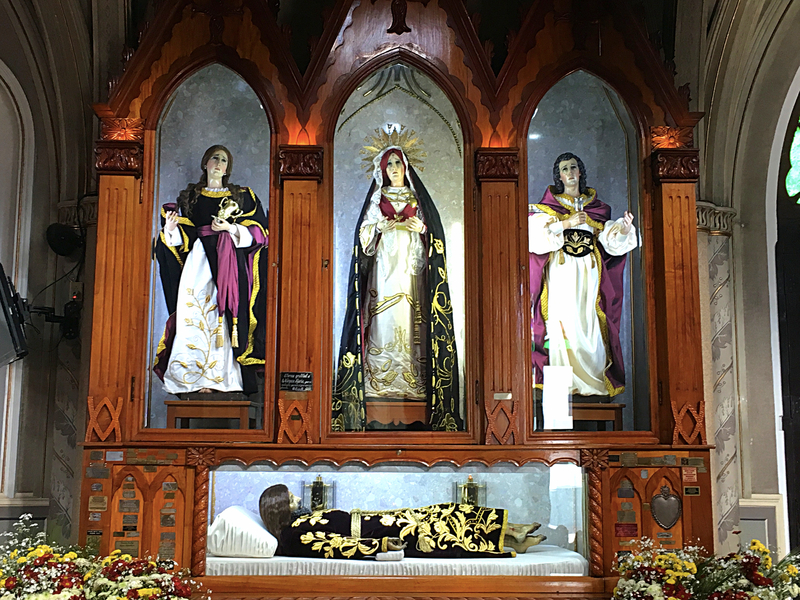 This is the picture I took inside the Church of St. Thomas; you can see the woman in the foreground telling me not to. Note the candles burning on small slabs, essentially on the floor, a unique placement in my experience at least. The church is pretty interesting. It was built in the mid-16th century atop an old Mayan temple platform and locals still use it for Mayan rituals. 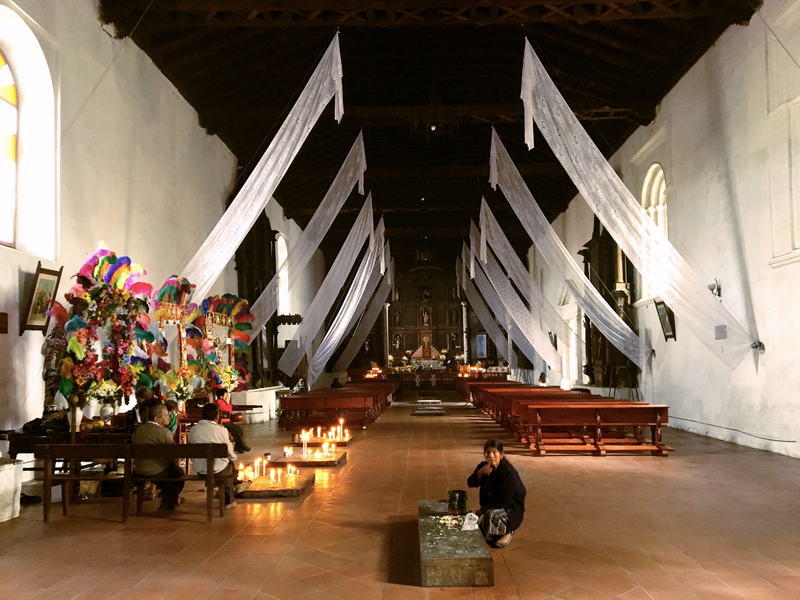 The 18 steps leading up to the church represent the 18 months of the Mayan calendar and Mayan incense is a nearly constant presence. Apparently Mayan priests occasionally sacrifice and burn chickens there, but we were spared that scene. Catholic, yes, but in some cases just barely. 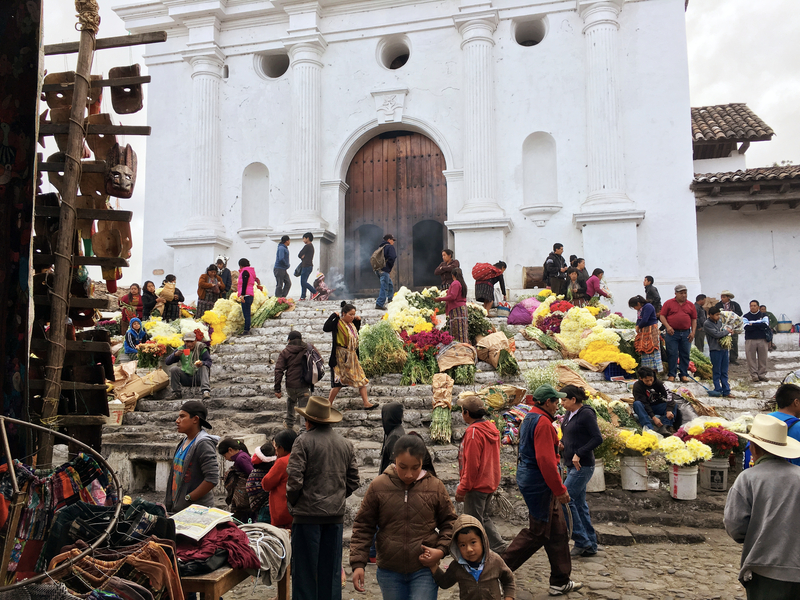 The steps of the Church of St. Thomas, where the local flower market occurs on market Sunday. Note the woman up by the door swinging her incense. 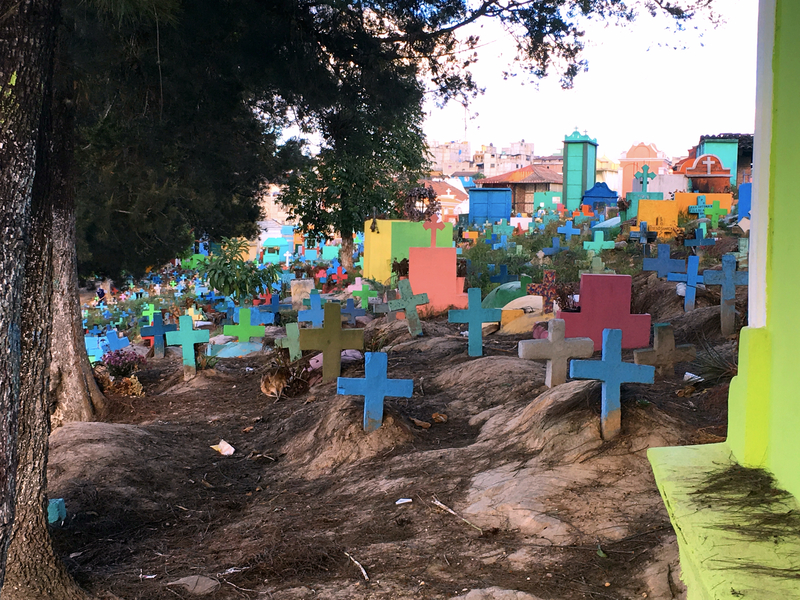 One other very cool part of Chichi was the cemetery. Now, Mark & I are often fans of cemeteries which can be delightful places to wander. 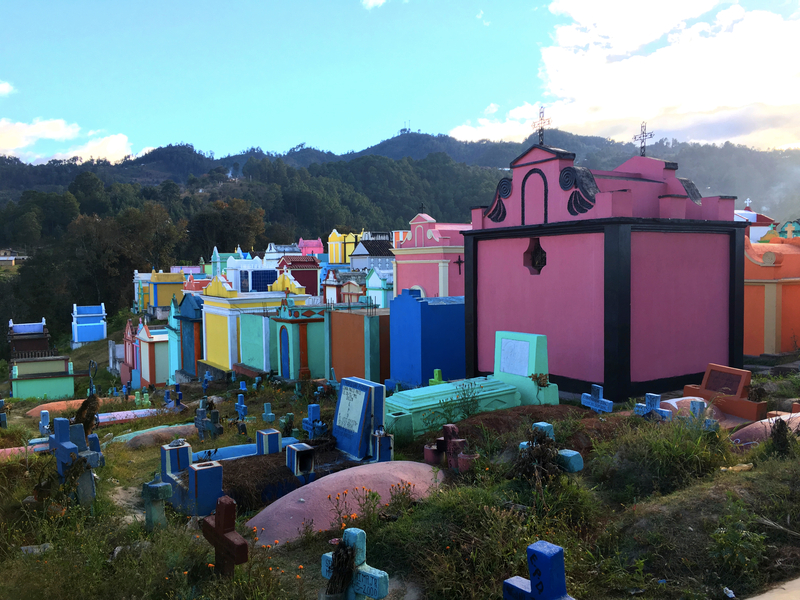 This was a cemetery to remember, simply the brightest, most colorful cemetery you’ve ever seen, like a shimmering Oz sitting across a valley from the main town. Somber is not a word you would describe here; while the buildings in town are subdued, the (smaller) buildings in the cemetery are brilliant and lively. Makes you kind of look forward to death if you could hang out in a place this fun. 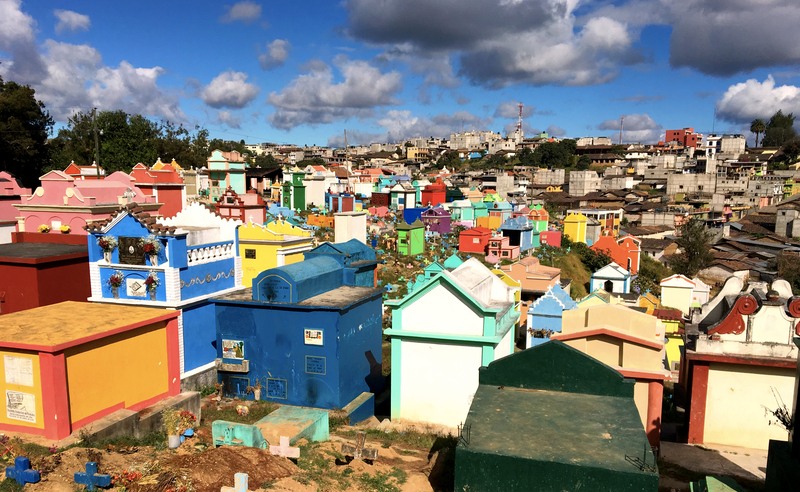 Chichi’s brilliant, colorful market is an unexpected counterpoint to the sobriety usually associated with cemeteries. Note how somber the grey buildings of the town are in the background. 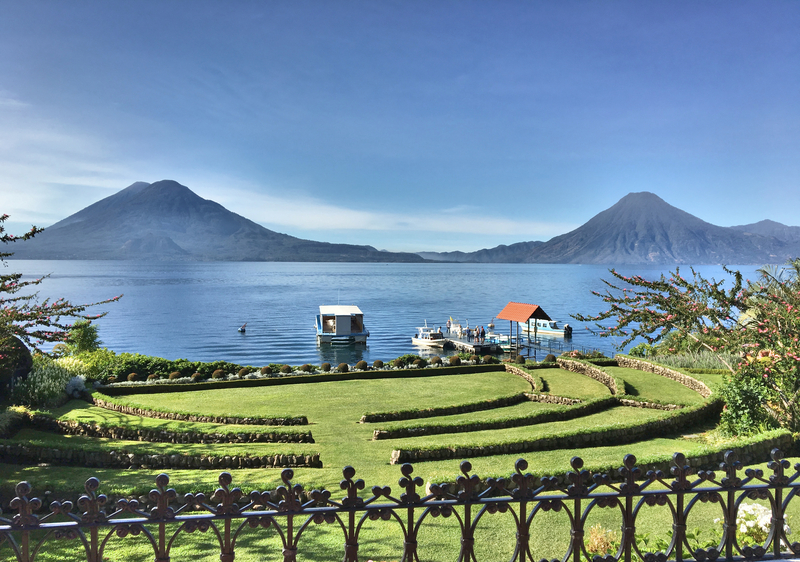 So after a quick stop here, it’s off to Lake Atitlan, a big volcano-surrounded lake an hour or two south of here. Mark & I were there four years ago and we’re pretty excited to go back! 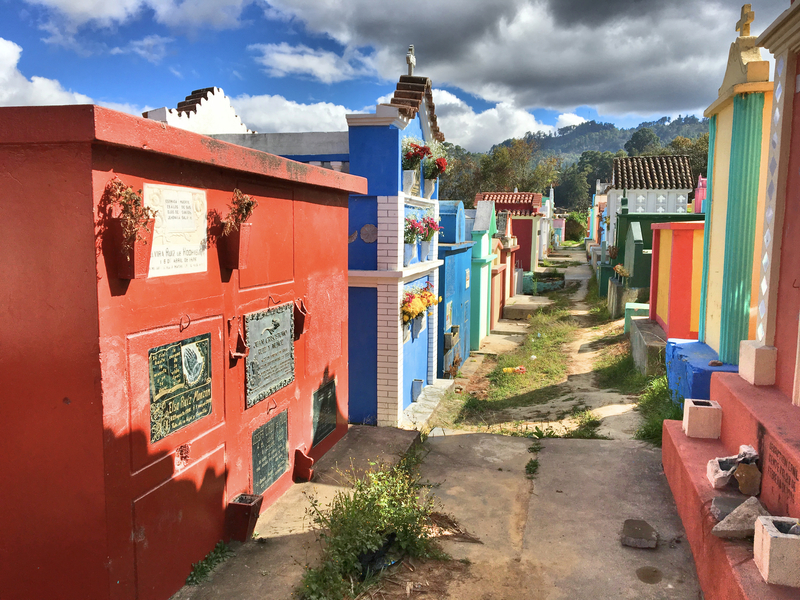 A “street view” from Chichi’s cemetery. To our surprise, Mark & I have become serious church goers. I recently wondered out loud to him how many people in the world have been in more churches than we have in the last three years. Not many, I’ll bet. 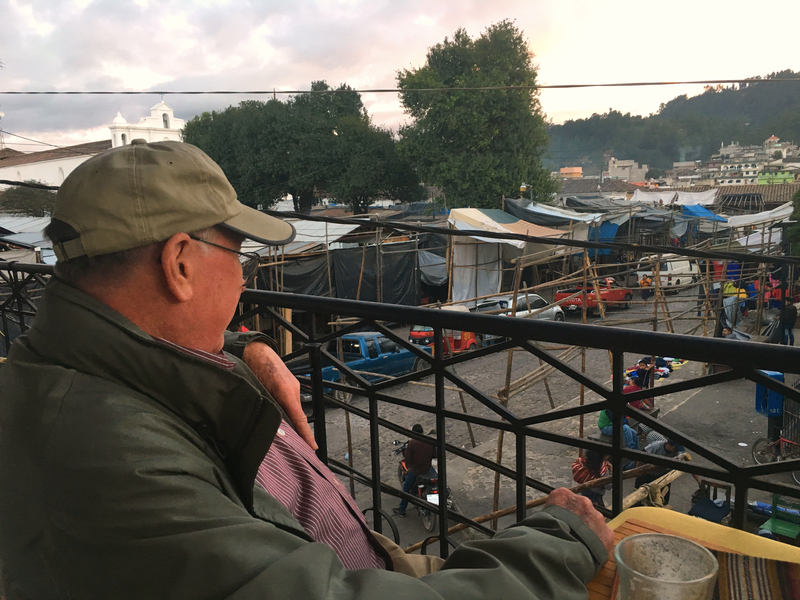 Finally, a scene from the main square in Quetzaltenango. 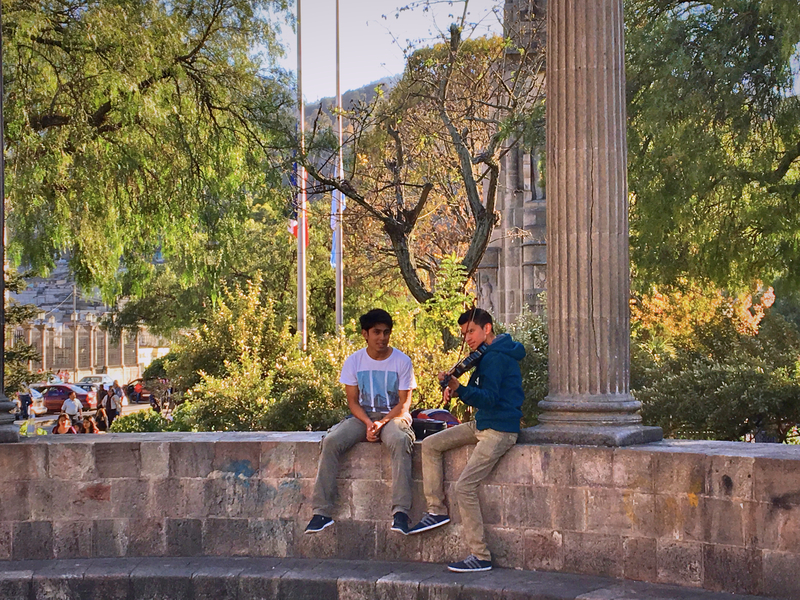 At the center of the plaza is a rotunda of Ionic colums dedicated to a local composer, so it seemed appropriate that these guys were practicing their violin here. 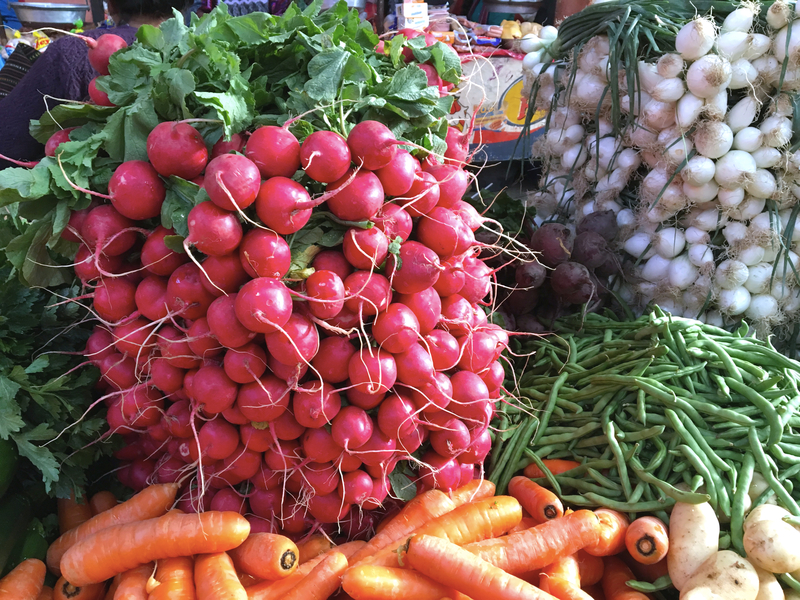 A huge vegetable market. With his green coat, Mark is never hard to find in a crowd. Another picture from the cemetery. I mean, of you could spend eternity in a hot pink house, wouldn’t you?